For other uses, see Javier Hernández (disambiguation). This name uses Spanish naming customs: the first or paternal family name is Hernández and the second or maternal family name is Balcázar. Javier Hernández Balcázar (Spanish pronunciation: [xaˈβjeɾ eɾˈnandez βalˈkasaɾ] ( listen);[a] born 1 June 1988) is a Mexican professional footballer who plays as a striker for Premier League club West Ham United and the Mexico national team. Hernández is commonly known by his nickname, Chicharito ([tʃitʃaˈɾito]; Mexican Spanish: little pea), which he wears on his shirt. Hernández began his career in 2006, playing for Mexican club Guadalajara. In July 2010, he became the first Mexican player to join Manchester United, scoring 20 goals and winning the Premier League in his debut season. After falling out of favour under managers David Moyes and Louis van Gaal, he spent the 2014–15 season on loan at Real Madrid. In August 2015, Hernández signed for Bundesliga club Bayer Leverkusen. After two seasons in Germany, Hernández returned to the Premier League and joined West Ham United. His minutes-per-goal ratio is among the most prolific in the history of the Premier League. A Mexican international, Hernández is the country's all-time leading goalscorer. He made his debut for the national team in September 2009 in a friendly match against Colombia. He has represented Mexico at the 2010 FIFA World Cup, the 2011 CONCACAF Gold Cup, the 2013 FIFA Confederations Cup, the 2014 FIFA World Cup, the Copa América Centenario, the 2017 FIFA Confederations Cup and the 2018 FIFA World Cup. He was the 2011 Gold Cup's top scorer with seven goals and was named the most valuable player of the tournament. Hernández was born in Guadalajara, Jalisco and first played in a recreation league when he was seven years old. Hernández lived in Morelia, Michoacán for over four years while his father, footballer Javier "Chícharo" Hernández, played for Monarcas Morelia. While living in Morelia, Hernández attended elementary school at the Instituto Piaget where he studied from third to sixth grade and played for the school's football team. At the age of nine, Hernández joined C.D. Guadalajara and signed his first professional contract when he was 15. He was set to play in the 2005 FIFA U-17 World Championship, but an injury sidelined him from the team that ultimately won the championship. Whilst playing football professionally, Hernández was also taking business administration classes at Universidad del Valle de Atemajac. Hernández has held both Hugo Sánchez and Rafael Márquez as his football idols growing up. Hernández made ten appearances in the 2008 Apertura without scoring, but he scored four goals in fifteen appearances in the 2009 Clausura. In the 2009 Apertura, Hernández finished as the joint-third top scorer, with eleven goals in seventeen appearances. He started the 2010 Torneo Bicentenario with eight goals in five games. He finished as a joint-leader in the goalscoring chart for the 2010 Torneo Bicentenario, with ten goals in eleven games and after spent 5 matches without playing because of an injury he suffered. On 8 April 2010, Hernández agreed a deal to sign for Manchester United for an undisclosed fee, subject to a work permit application. The previous day, Hernández had been present at Manchester United's Champions League quarter-final win over Bayern Munich at Old Trafford. The deal was conducted in complete secrecy; Hernández's agent was kept in the dark, as was his grandfather Tomás Balcázar, who thought Hernández was going on a trip to Atlanta in the United States. As part of the deal, United played a friendly against Chivas to open the Mexican club's new stadium on 30 July. On 27 May, the work permit was granted, allowing the transfer to be made official on 1 July. Hernández made his United debut on 28 July, coming on as a 63rd-minute substitute for Nani in the 2010 MLS All-Star Game at the NRG Stadium, Houston; he scored his first goal for the club 18 minutes later, lobbing the ball over Nick Rimando from just outside the area after a long through-ball from Darren Fletcher. Two days later, Hernández scored against Manchester United while playing in a friendly for his old club, Chivas; he started the game in a Chivas jersey and scored after just eight minutes. He switched sides at half-time, but he was unable to prevent a 3–2 defeat for Manchester United. He scored for the third pre-season game in a row as he netted in a 7–1 victory over a League of Ireland XI at the newly built Aviva Stadium on 4 August. 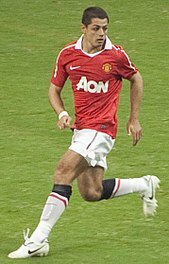 Hernández made his competitive debut on 8 August and scored his first goal in the process, netting United's second of a 3–1 victory over Chelsea in the 2010 FA Community Shield. He came on at the start of the second half and got on the end of a pass from Antonio Valencia before the Mexican's shot deflected off his own face and into the net. On 16 August, Hernández made his Premier League debut as he replaced Wayne Rooney in the 63rd minute of their 3–0 home victory over Newcastle United. He scored his first Champions League goal on 29 September, coming off the bench to score the only goal in an away win over Valencia. He scored his first league goal for United in a 2–2 home draw against West Bromwich Albion on 16 October. Eight days later he scored his first brace for the club, also his first away league goals, in a 2–1 away win over Stoke City. Two days on from this display, he came off the bench to score a last-minute winner, his first ever League Cup goal, in a 3–2 win over Wolves which sent them through to the quarter-finals where they were then knocked out by West Ham United. On 1 January 2011, he came off the bench to head the winning goal in a 2–1 away win over West Bromwich Albion. Hernández became the top scoring Mexican in Premier League history after opening the scoring in a 2–1 home victory over Stoke City on 4 January. On 25 January, Hernández scored the equalising goal of a 3–2 comeback away win over Blackpool. Four days later he scored his first FA Cup goal as he netted the winner in a 2–1 away victory over Southampton. Hernández netted twice in a 4–0 away win over Wigan on 26 February. Eight days later, he netted a late consolation goal in a 3–1 derby defeat away to Liverpool. Hernández netted twice in a 2–1 home win over Marseille on 15 March, sending United through to the quarter-finals of the Champions League. On 2 April, he scored the final goal against West Ham United as they came from two goals down to claim a 4–2 away win. On 8 April, Hernández was revealed as a contender for the PFA Young Player of the Year award alongside teammate Nani. Four days later, he opened the scoring in the 2–1 quarter-final win over Chelsea in the Champions League, with the game ending 3–1 on aggregate, sending United through to the semi-finals. He continued his goal scoring form on 23 April scoring the winning goal with a header in the 1–0 home win over Everton. On 8 May, Hernández scored the opening goal in a 2–1 home win over Chelsea after just 36 seconds to leave United one point away from winning the title. The goal against Chelsea made him the first player since Ruud van Nistelrooy in the 2001–02 season to score 20 goals for the club in his debut season. Hernández capped his debut season with Manchester United by winning the Sir Matt Busby Player of the Year award on 18 May which was voted for by the fans. On 28 May, Hernández played all 90 minutes in the 3–1 defeat to Barcelona in the Champions League Final. On 5 July 2011, the International Federation of Football History and Statistics named Hernández as the "World Goalgetter 2011", with 13 goals, ahead of other players such as Cristiano Ronaldo, Giuseppe Rossi, and Lionel Messi. After participating in the 2011 CONCACAF Gold Cup with Mexico, Hernández returned to Manchester United to begin pre-season training in New York ahead of the 2011 MLS All-Star Game. On 26 July 2011, he was taken to the hospital after suffering a minor concussion after he was hit on the head with a ball during a training session; he was cleared the next day, but did not take part in the game. On 28 July 2011, it was reported that Rafael Ortega, the doctor at Chivas, informed Manchester United that Hernández was suffering from a pre-existing neurological condition. Ortega also explained that Hernández had suffered from "acute migraines and "headaches" as a teenager. He did not participate in any of United's pre-season matches, nor the 2011 FA Community Shield. He also missed United's opening game of the season against West Bromwich Albion. Hernández made his first appearance in the 2011–12 season on 22 August in a 3–0 win against Tottenham Hotspur, coming off the bench for Danny Welbeck in the 79th minute. He returned to the starting lineup on 10 September against Bolton Wanderers, scoring twice in a 5–0 victory. On 15 October 2011, Hernández came off the substitutes bench to net a crucial equaliser against Liverpool at Anfield in a 1–1 draw. In the 81st minute Hernández gambled on Danny Welbeck's flick on from a corner to steal in and head the equaliser. Hernández signed a new five-year contract on 24 October to tie him to Manchester United until 2016. Hernández scored his fourth league goal of the season and the winner against Everton at Goodison Park, in a 1–0 victory on 29 October. He then scored his fifth league goal of the season and the winner in United's next away game at Swansea City, a 1–0 win. Hernández scored again in the following game at home to Newcastle United, when Wayne Rooney's shot was blocked by a defender and ricocheted back off Hernández and into the net. He was then carried off the pitch early in United's next league game away at Aston Villa, appearing to go over on his ankle without a challenge from an opponent. After the match, manager Sir Alex Ferguson said Hernández had suffered ankle ligament damage and would be out for up to four weeks. On 18 December, Hernández made a surprise early return against Queens Park Rangers. He came on as a 63rd-minute substitute for Danny Welbeck in United's 2–0 victory at Loftus Road. On 31 January 2012, Hernández scored his first goal since November, and his seventh goal of the season in a 2–0 league win at Old Trafford against Stoke City, scoring the first of two penalties. Hernández continued his scoring form on 5 February at Stamford Bridge against Chelsea, scoring the third goal of a three-goal comeback draw, heading in a cross from Ryan Giggs. On 16 February, Hernández scored his first goal in the Europa League, in a 2–0 away win against Ajax in the round of 32. He scored again in the second leg at Old Trafford on 23 February, but this time in a 2–1 home defeat. However, United still won the tie 3–2 on aggregate. On 18 March, Hernández scored twice in a 5–0 win over Wolverhampton Wanderers. Hernández began his third season with United on 2 September 2012, coming on as a 72nd-minute substitute for Danny Welbeck in a 3–2 win against Southampton. On 15 September, he was named in the starting eleven for the match against Wigan Athletic, playing all 90 minutes. Despite having a penalty saved in the fifth minute by Wigan goalkeeper Ali Al-Habsi, Hernández scored his first goal of the season, as well as assisting in teammate Nick Powell's goal in a 4–0 victory. On 23 October, Hernández netted a brace in a 3–2 comeback win against Braga in a Champions League group stage match after United had gone down 2–0 in the first half. Five days later, he scored the winner against nine-man Chelsea in a controversial 3–2 win after he was deemed to have been in an offside position when scoring the goal. On 10 November 2012, Hernández came on as a second-half substitute and scored two goals as United came from 2–0 down to beat Aston Villa 2–3 at Villa Park. At the end of the match, Hernández claimed the hat-trick, but replays showed that his shot for United's second goal was hit wide until turned into his own net by Villa defender Ron Vlaar. On 24 November, he scored his fifth league goal of the season in a 3–1 home win over Queens Park Rangers. On 26 December, Hernández scored United's fourth goal in the final minutes in a 4–3 win over Newcastle United at Old Trafford. He then began 2013 by scoring a brace against Wigan on 1 January, helping United to a 4–0 victory. On 26 January, Hernández would go on to score another brace, this time during an FA Cup match against Fulham which United won 4–1. In another FA Cup match against Reading on 18 February, Hernández scored in the 72nd minute, giving United a 2–0 lead. His goal would end up being a deciding factor as United went on to win the game 2–1. Although he started in United's 2–0 Premier League victory against QPR on 23 February 2013, he did not score in the match and he didn't score again until 10 March in another FA Cup match against Chelsea which ended in a 2–2 draw. Hernández opened the scoring in manager Sir Alex Ferguson's final home game at Old Trafford against Swansea City. After a free kick was not cleared, he slotted in from six yards in the first half to put United 1–0 up, in a game they went on to win 2–1. Hernández scored United's last goal of the season and the final goal of the Ferguson era, when he tapped in a cross from close range in a 5–5 draw away at West Bromwich Albion on the final day. Hernández scored his first goal of the season under new manager David Moyes on 25 September 2013, netting the only goal of a home win over rivals Liverpool in the third round of the League Cup. On 26 October, with his first league goal of the campaign, he headed the winner as they came from behind to defeat Stoke 3–2 at Old Trafford. Three days later, he recorded a brace – starting with a penalty – in a 4–0 win against Norwich City in the next round of the League Cup. In the tournament's semi-finals, his goal from Adnan Januzaj's cross in the last minute of extra time forced a penalty shootout, which United lost to Sunderland. On 1 September 2014, Hernández signed for Real Madrid on a season-long loan deal, with an option of a purchase at the end of the loan. He underwent a medical and signed the contract that same day. He made his debut in the Madrid derby on 13 September, replacing Karim Benzema for the final 27 minutes as the team lost 2–1 at home to Atlético Madrid. On 19 September, Hernández came on as a 77th-minute substitute for Gareth Bale and scored his first two goals in an 8–2 away win against Deportivo de La Coruña. He scored the winning goal on 22 April 2015 in the 1–0 win over Atlético Madrid, which sent Real Madrid into the semi-finals of the Champions League. Four days later, Hernández scored a brace in Madrid's 2–4 away win over Celta de Vigo. On 26 May, it was announced that Hernández would return to Manchester United following the end of his loan spell after Real Madrid decided not to make the loan move a permanent deal. On 29 August 2015, it was reported that Manchester United manager Louis Van Gaal had told Hernández he could leave the club before the closure of the transfer window. Although with one year of his contract still remaining, it was unclear with scale of transfer fee United would demand for him. Hernández played in what proved to be his final match for Manchester United on 22 August in a scoreless draw against Newcastle United at Old Trafford. He came on as a substitute in the 67th minute, replacing Adnan Januzaj. As he often came on as a substitute during his time with Manchester United, Hernández's minutes per goal ratio is among the most prolific in the history of the Premier League. On 31 August 2015, it was announced Hernández signed a three-year contract with Bundesliga club Bayer Leverkusen for an undisclosed fee, reportedly £7.3 million. Hernández made his Bundesliga debut as a 58th-minute substitute in the 1–0 defeat to Darmstadt 98 on 12 September. Four days later he scored his first goal in the Champions League group-stage match against BATE Borisov, scoring the third goal in the 4–1 victory. On 23 September, Hernández scored his first Bundesliga goal in Bayer's 1–0 victory over FSV Mainz, being also named Man of the Match. On 20 October, Hernández scored his first brace for Leverkusen in their 4–4 draw against Roma in the Champions League. He ended the Champions League group stage with five goals from six matches but Bayer failed to qualify for the knockout phase, finishing third in Group E and dropping into the Europa League. Hernández was named Bundesliga Player of the Month for November; a month in which he scored in a 2–1 loss at home to 1. FC Köln and twice in 3–1 win at Eintracht Frankfurt. On 12 December, Hernández scored his first hat-trick in Leverkusen's 5–0 win over Borussia Mönchengladbach, thus scoring 15 goals in his last 12 matches, and taking his tally to 17 goals in 20 matches. He would again be named Bundesliga Player of the Month for December. On 30 January 2016, in Bayer's second match after the winter break, Hernández scored twice in a 3–0 defeat of Hannover 96 to register his 20th and 21st goals of the season. Two days later, he was named for the third time Bundesliga Player of the Month. Hernández scored and provided an assist in Leverkusen's 2–1 win over SC Hauenstein in the first round of the DFB-Pokal on 21 August 2016. Two days later, it was reported that Hernández would miss Bayer's opening match of the season against Borussia Mönchengladbach after sustaining a broken hand. On 17 September, Hernández scored his first goal of the Bundesliga season at Eintracht Frankfurt, however he missed a chance to equalize late from the penalty spot in the 2–1 loss. The following week at FSV Mainz 05, Hernández collected a perfect hat-trick that included a stoppage time winner, the third hat trick of the Bundesliga season. He was later named Bundesliga Player of the Month for September. On 28 January 2017, Hernández scored Bayer Leverkusen's second goal in the 2–3 loss to Borussia Mönchengladbach, ending his eleven-match scoreless streak. On 21 February, following the match against Atlético Madrid, Hernández became the Mexican player with the most appearances in the Champions League with 47, surpassing Rafael Márquez's previous record of 46 appearances. On 24 July 2017, Hernández joined English club West Ham United for an undisclosed fee, reported to be around £16 million, signing a three-year contract. He made his debut for the West Ham on 13 August, playing all 90 minutes in the 4–0 defeat against his former club Manchester United at Old Trafford. The following week, Hernández scored his first two goals for West Ham in the 3–2 loss to Southampton. In November, Hernández sustained a hamstring injury while on international duty with Mexico, and it was reported that he would be ruled out from activity for up to two weeks. Following the sacking of Slaven Bilić and the appointment of David Moyes as manager, there were fears Hernández would be excluded at West Ham as he was at Manchester United. In response, Moyes referred to him as a "top goalscorer," and "a brilliant finisher." During the winter transfer window there were reports Hernández would exit the club after only six months, being linked with a move to Turkish club Beşiktaş as well as a possible return to Manchster United. On 20 January 2018, he came off the bench to score the equalizing goal for West Ham in their 1–1 league draw against Bournemouth, scoring his first goal since October. Following the match Moyes praised Hernández's performance, saying "we needed him today." On 8 April, in a league match against Chelsea, he scored a 73rd-minute goal to make the score 1–1, marking the ninth time he has scored against the club. On 28 August 2018, Hernández scored West Ham's third goal in injury time of a 3–1 victory over AFC Wimbledon in the second round of the EFL Cup. In September, West Ham manager Manuel Pellegrini declared that Hernández was suffering from glandular fever, causing him to miss out various matches. He would recover and return to training in October. On 3 November, he scored his first Premier League goal of the season in West Ham's 4–2 victory over Burnley. On 22 February 2019, Hernández scored the equalizing goal in West Ham’s eventual 3–1 win over Fulham; on initial viewing, it looked like he had headed the ball in from a yard to score, however replays of the goal appeared to show the ball rebound off of Hernández’s arm to put the ball into the net. It was also his 50th career Premier League goal, becoming the first Mexican to reach the milestone. He would get on the scoresheet again on 16 March, coming on as a second-half substitute and scoring twice—including the stoppage-time winner—to secure a 4–3 league victory over Huddersfield. Hernández was one of the 21 players called up to the Mexican under-20 national team for the 2007 FIFA U-20 World Cup in Canada; he came in as a late substitute in the opening game against Gambia and scored Mexico's 3–0 goal. On 30 September 2009, Hernández made his debut for Mexico against Colombia, where he made an assist in a 2–1 loss. On 24 February 2010, Hernández scored two goals against Bolivia and had an assist for Braulio Luna's goal. On 3 March, Hernández scored a header against New Zealand, giving Mexico the lead in a 2–0 victory. On 17 March, Hernández scored his fourth international goal to give Mexico a 2–1 victory over North Korea. On 26 May, he scored a consolation header against the Netherlands in a 2–1 loss. On 30 May, Hernández scored yet again, netting twice in a 5–1 victory over Gambia. On 11 June, Hernández made his FIFA World Cup debut during the opening game of the 2010 tournament against South Africa in a 1–1 draw, coming on in the 73rd minute to replace Guillermo Franco. On 17 June, Hernández again came off the bench and this time scored his first ever World Cup goal, netting the first in a 2–0 victory over France by springing the offside trap, latching onto a through ball from Rafael Márquez, sidestepping Hugo Lloris and sidefooting into the net. By scoring he emulated his grandfather, Tomás Balcázar, who scored against France in the 1954 World Cup. He was elected as man of the match. On 27 June, Hernández made his first start at a World Cup and netted his second goal of the World Cup, by turning Martín Demichelis on the edge of the box before sending a left-foot shot into the roof of the net, in Mexico's 3–1 loss against Argentina in the round of 16. FIFA's statistical analysis showed that Hernández was the quickest player in World Cup 2010, reaching a top speed of 32.15 km/h. Hernández scored another goal in his first match for Mexico since the World Cup, in a friendly against world champions Spain on 11 August 2010. He scored after just 12 minutes of the match, but David Silva equalised for Spain in the last minute of play to claim a 1–1 draw. Hernández scored his and Mexico's first international goal of 2011 as he opened the scoring in a 2–0 win over Bosnia and Herzegovina on 9 February. On 26 March, Hernández scored two goals in an international friendly against Paraguay. He first connected with a pass from Pablo Barrera in the sixth minute of the match, before scoring off a low cross in the 29th minute, three minutes after teammate Andrés Guardado had made the score 2–0. He exited to a standing ovation in the 65th minute. On 5 June 2011, he scored a hat-trick, the first in his career, in a 5–0 win against El Salvador. On 9 June 2011, he scored two goals, in the 36th and 76th minutes against Cuba. On 18 June 2011, Hernández scored the winner in a 2–1 win over Guatemala to send Mexico to the semi-finals. On 22 June 2011, he helped Mexico reach the Gold Cup Final after a 2–0 win over Honduras in extra-time, where he scored Mexico's second goal in the 99th minute. Hernández was the Gold Cup's top scorer with seven goals and was named the most valuable player of the tournament, in addition to helping his team to a 4–2 victory in the Final against the United States. Hernández was selected in Mexico's squad for the 2013 FIFA Confederations Cup. On 16 June, he scored from a penalty kick in the team's opening match, a 2–1 defeat to Italy at the Estádio do Maracanã. In the final group match, Hernández scored both goals as El Tri defeated Asian champions Japan 2–1. Hernández scored five times for Mexico during qualification for the 2014 FIFA World Cup. On 23 June, Hernández scored Mexico's third goal against Croatia in their 3–1 victory at Arena Pernambuco to qualify the team for the round of 16. On 1 July 2015, Hernández sustained a broken collar bone during a friendly match against Honduras, ruling him out of the 2015 CONCACAF Gold Cup, which Mexico went on to win. Hernández was included in Mexico's 23-man squad that would participate in the Copa América Centenario tournament. On 5 June 2016, he played 83 minutes in the 3–1 victory over Uruguay, and scored the first goal in Mexico's 2–0 win over Jamaica. The goal took Hernández's tally to 45, one goal shy of tying Jared Borgetti's national team record. On 27 May 2017, Hernández became Mexico's all-time top goalscorer with 47 goals when he scored in a friendly against Croatia. Hernández was included in the national squad that would play in the FIFA Confederations Cup in Russia. He scored Mexico's first goal in an eventual 2–2 draw against Portugal on 18 June, scoring a low header from a Carlos Vela cross. Hernández scored three times for Mexico during qualification for the 2018 FIFA World Cup. He was in the starting lineup in Mexico's first World Cup game against Germany at the Luzhniki Stadium in Moscow and made an assist to Hirving Lozano to go on to win the match 1–0. In the second group game Hernández scored Mexico's second goal, his 50th international goal, in their 2–1 win over South Korea, and was named FIFA Man of the Match. With his goal, Hernández became the joint-highest scoring Mexican player at the World Cup with four goals, tied with Luis Hernández, and the third Mexican player to score in three World Cups. He went on to start in the final group stage match against Sweden, as well as in the round-of-16 loss to Brazil. A clinical goalscorer, Hernández has been described as a "goal-poacher", due to a number of his goals being scored from close-range. His movement off the ball, pace, and ability to find space inside the box has also been praised. He has been described as one of the few players who seem capable of appearing behind a defender's back to knock in the ball from two yards, with his playing style being compared to that of German striker Miroslav Klose. Rudi Völler, sporting director of Bayer Leverkusen, has praised Hernández for his keen positioning in front of goal, saying: "he certainly doesn't win every tackle but he has an incredible sense of where the ball will end up". Former Manchester United manager Sir Alex Ferguson described Hernández as two-footed, very quick, in possession of a good spring, and a natural goalscorer. Ferguson also said Hernández's style reminds him of former United striker Ole Gunnar Solskjær – the so-called "baby-faced assassin" who scored the injury time winner against Bayern Munich in United's 1999 Champions League triumph. Hernández's former teammate Jesús Padilla described him as "amazing in the air" despite his height. Due to his small stature, he is extremely quick and agile, also possessing good technique. In a May 2016 interview with Sports Illustrated, Hernández commented on his abilities inside the penalty area, describing the intuition he has in knowing where an impending cross will fall from a teammate and outsmarting opposing defenders. Former Mexico national team coach Juan Carlos Osorio described Hernández as having "a knack for the goal. Sometimes it seems like every rebound or every deflection goes into his path. Another thing is he doesn't dwell on a missed opportunity. He always looks forward to the next one. He has good ability in the air. He has good pace, and he makes those diagonal runs starting from the first defender in behind the second one. He also has the willingness to work defensively." Hernández is the son of Javier Hernández Gutiérrez, who played for three clubs in Mexico and was a member of the Mexico squad at the 1986 FIFA World Cup. Hernández Gutiérrez quit his job as manager of Guadalajara's reserve side in order to watch Hernández play in the 2010 World Cup in South Africa. Hernández is also the grandson of Tomás Balcázar, who also played for Guadalajara and played for the national side in the 1954 FIFA World Cup. On 26 May 2012, Hernández became the Mexican ambassador for UNICEF, making him the third Mexican to serve this position, following César Costa and Julieta Venegas in 2004 and 2009 respectively. As ambassador, he will participate in a number of activities to encourage children and teenagers to not abandon their education. He was commemorated in a news conference, where he said he felt "proud and committed". Hernández is a devout Roman Catholic. He is well known for his pre-game ritual where he gets on his knees and prays which he performs before most games. On 27 June 2013, EA Sports announced that they had featured Hernández on the North American cover of FIFA 14, alongside global cover star Lionel Messi. In January 2019, Hernández and his girlfriend Sarah Kohan, an Australian model and travel blogger, announced on Instagram that they were expecting their first child. Hernández is commonly known as Chicharito, meaning little pea in Spanish, and wears the name on his shirt. This is due to his father, Javier Hernández Gutiérrez, being nicknamed Chícharo (pea) because of his green eyes. ^ In isolation, Hernández is pronounced [eɾˈnandes]. ^ "Javier Hernandez – Quote, Unquote". Manchester United F.C. Archived from the original on 14 May 2011. Retrieved 27 April 2011. ^ a b "Best goal ratios of Premier League players". Premier League. Retrieved 28 September 2016. ^ a b "La Zanahoria de el Chicharito". Zocalo.com.mx (in Spanish). Zócalo. 15 January 2012. Retrieved 12 November 2015. ^ a b c Witz, Billy (1 April 2010). "For World Cup, Javier Hernández Could Be Mexico's Next Big Thing". The New York Times. Retrieved 30 June 2010. ^ "Javier Hernández". ESPN Soccernet. Retrieved 1 July 2010. 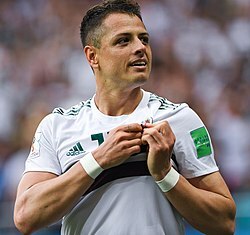 ^ "'Chicharito' elogia a Johan Cruyff y Rafael Márquez" (in Spanish). El Sigoro De Torreón. 25 March 2012. ^ "Centenario: 17 Things To Know About Mexico's Javier 'Chicharito' Hernández". Latintimes. 2 June 2016. ^ Worrall, Frank (2012). Chicharito – The Biography of Javier Hernandez. John Blake Publishing. p. 11. ISBN 978-1-78219-079-0. ^ "Tabla de Goleo Individual". Femexfut. Retrieved 30 June 2010. ^ "History awaits flawless Chivas". FIFA. 26 February 2010. Retrieved 30 June 2010. ^ "Estadística – Primera División Profesional – Temporada 2009–2010 Torneo Bicentenario". Femexfut. Retrieved 30 June 2010. ^ Coppack, Nick (9 April 2010). "Boss: We had to move fast". Manchester United F.C. Retrieved 1 July 2010. ^ Communications Dept. (8 April 2010). "Reds agree Hernandez deal". Manchester United F.C. Retrieved 8 April 2010. ^ Thompson, Gemma (8 April 2010). "Chicharito's 'dream' move". Manchester United F.C. Retrieved 13 April 2010. ^ White, Duncan (11 April 2010). "Javier Hernandez, aka El Chicharito, living the Manchester United dream". The Daily Telegraph. London. Retrieved 30 June 2010. ^ Marshall, Tom; Bartram, Steve (9 June 2010). "United's covert operation". Manchester United F.C. Retrieved 30 June 2010. ^ Marshall, Tom (8 April 2010). "Manchester United to play Chivas at new stadium". Guadalajara Reporter. Archived from the original on 11 July 2011. Retrieved 8 April 2010. ^ Tuck, James (27 May 2010). "Chicharito granted work permit". Manchester United F.C. Retrieved 27 May 2010. ^ Thompson, Gemma (28 July 2010). "MLS All-Stars 2 United 5". Manchester United F.C. Retrieved 28 July 2010. ^ Thompson, Gemma (30 July 2010). "Chivas 3 United 2". Manchester United F.C. Archived from the original on 13 August 2011. Retrieved 1 August 2010. ^ Coppack, Nick (4 August 2010). "Ireland XI 1 United 7". Manchester United F.C. Retrieved 4 August 2010. ^ Stevenson, Johnson (29 September 2010). "Valencia 0–1 Man Utd". BBC Sport. Retrieved 29 September 2010. ^ Sanghera, Mandeep (16 October 2010). "Man Utd 2–2 West Brom". BBC Sport. Retrieved 16 October 2010. ^ McNulty, Phil (24 October 2010). "Stoke 1–2 Man Utd". BBC Sport. Retrieved 24 October 2010. ^ Stevenson, Jonathan (26 October 2010). "Man Utd 3–2 Wolves". BBC Sport. Retrieved 26 October 2010. ^ Whyatt, Chris (30 November 2010). "West Ham 4–0 Man Utd". BBC Sport. Retrieved 30 November 2010. ^ Chowdhury, Saj (1 January 2011). "West Brom 1–2 Man Utd". BBC Sport. Retrieved 1 January 2011. ^ Stevenson, Jonathan (4 January 2011). "Man Utd 2–1 Stoke". BBC Sport. Retrieved 4 January 2011. ^ McNulty, Phil (25 January 2011). "Blackpool 2–3 Man Utd". BBC Sport. Retrieved 25 January 2011. ^ Hughes, Ian (28 January 2011). "Southampton 1–2 Man Utd". BBC Sport. Retrieved 28 January 2011. ^ Whyatt, Chris (26 February 2011). "Wigan 0–4 Man Utd". BBC Sport. Retrieved 26 February 2011. ^ McNulty, Phil (6 March 2011). "Liverpool 1–3 Man Utd". BBC Sport. Retrieved 6 March 2011. ^ McNulty, Phil (15 March 2011). "Man Utd 2–1 Marseille". BBC Sport. Retrieved 15 March 2011. ^ Sanghera, Mandeep (2 April 2011). "West Ham 2–4 Man Utd". BBC Sport. Retrieved 2 April 2011. ^ "Gareth Bale & Samir Nasri lead PFA nominations". BBC Sport. 8 April 2011. Retrieved 8 April 2011. ^ McNulty, Phil (12 April 2011). "Man Utd 2–1 Chelsea". BBC Sport. Retrieved 12 April 2011. ^ Stevenson, Jonathan (23 April 2011). "Man Utd 1–0 Everton". BBC Sport. Retrieved 23 April 2011. ^ McNulty, Phil (8 May 2011). "Man Utd 2–1 Chelsea". BBC Sport. Retrieved 8 May 2011. ^ Taylor, Daniel (9 May 2011). "Manchester United on brink of record 19th title after win over Chelsea". The Guardian. London. Retrieved 9 May 2011. ^ Tuck, James (18 May 2011). "Fans honour Hernández". Manchester United F.C. Retrieved 18 May 2011. ^ Marshall, Adam (6 July 2011). "Javier is world's best". Manchester United F.C. Retrieved 7 July 2011. ^ "Manchester United's Javier Hernández taken to hospital with concussion". The Guardian. 27 July 2011. Retrieved 23 August 2011. ^ "Javier Hernandez hospitalized with concussion". Sports Illustrated. 28 July 2011. Retrieved 23 August 2011. ^ Taylor, Daniel (28 July 2011). "Javier Hernández's former club claim he has a neurological condition". The Guardian. Retrieved 23 August 2011. ^ "Hernandez 'may have neurological issue'". ESPN Soccernet. 29 July 2011. Retrieved 23 August 2011. ^ Coppack, Nick (22 August 2011). "Man United 3 Tottenham 0". Manchester United F.C. Retrieved 23 August 2011. ^ Bartram, Steve (10 September 2011). "Bolton 0 Man United 5". Manchester United F.C. Retrieved 10 September 2011. ^ "Liverpool 1–1 Man Utd". BBC Sport. 15 October 2011. Retrieved 16 October 2011. ^ "Javier Hernandez signs new five-year contract". BBC Sport. 24 October 2011. Retrieved 29 October 2011. ^ "Everton 0–1 Man Utd". BBC Sport. 29 October 2011. Retrieved 29 October 2011. ^ "Swansea 0–1 Man Utd". BBC Sport. 19 November 2011. Retrieved 19 November 2011. ^ Marshall, Adam (26 November 2011). "Report: United 1 Newcastle 1". Manchester United F.C. Retrieved 14 February 2015. ^ "Manchester United's Javier Hernandez suffers ankle ligament injury". BBC Sport. 3 December 2011. Retrieved 3 December 2011. ^ McNulty, Phil (18 December 2011). "QPR 0–2 Man Utd". BBC Sport. Retrieved 18 December 2011. ^ Fisher, Alex. "Man Utd 2–0 Stoke: Chicharito scores". Goal.com. Retrieved 31 January 2012. ^ "Man United win 2–0 at Ajax". Boston Herald. Retrieved 17 February 2012. ^ "BBC Sport – Manchester United 1–2 Ajax (agg: 3–2)". BBC (British Broadcasting Corporation). Retrieved 23 February 2012. ^ "Wolverhampton Wanderers vs. Manchester United – as it happened". The Guardian. Retrieved 18 March 2012. ^ "Southampton vs Man Utd". ESPN Soccernet. 3 September 2012. Retrieved 3 September 2012. ^ "Man Utd vs Wigan Athletic match report". ESPN Soccernet. 16 September 2012. Retrieved 17 September 2012. ^ McNulty, Phil (23 October 2012). "Man Utd 3–2 Braga". BBC Sport. Retrieved 23 October 2012. ^ McNulty, Phil (28 October 2012). "Chelsea 2–3 Man Utd". BBC Sport. Retrieved 28 December 2015. ^ "Javier Hernández hits double to give Manchester United victory at Villa Park". Metro.uk. 10 November 2012. ^ Jurejko, Jonathan (24 November 2012). "Man Utd 3–1 QPR". BBC Sport. Retrieved 28 December 2015. ^ Bartram, Steve (26 December 2012). "Report: United 4 Newcastle 3". Manchester United F.C. Retrieved 14 February 2015. ^ "Wigan 0–4 Manchester United". ESPN FC. 1 January 2013. Retrieved 23 March 2013. ^ "Manchester United 4–1 Fulham". ESPN FC. 26 January 2013. Retrieved 23 March 2013. ^ "Manchester United 2–1 Reading". ESPN FC. 18 February 2013. Retrieved 23 March 2013. ^ "Manchester United 2–2 Chelsea". ESPN FC. 10 March 2013. Retrieved 23 March 2013. ^ McNulty, Phil. "Manchester United 2–1 Swansea". BBC Sport. Retrieved 12 May 2013. ^ Johnston, Neil. "West Brom 5–5 Manchester United". BBC Sport. Retrieved 19 May 2013. ^ "Capital One Cup third round: Javier Hernandez goal sees Man Utd beat Liverpool". Sky Sports. 25 September 2013. Retrieved 31 August 2015. ^ Wright, David (26 October 2013). "Manchester United 3 – Stoke City 2: David Moyes' men fight back in scrappy win". Daily Express. Retrieved 31 August 2015. ^ "Man Utd 4–0 Norwich". BBC Sport. 29 October 2013. Retrieved 31 August 2015. ^ Taylor, Daniel (22 January 2014). "Sunderland beat Manchester United in dramatic shootout to reach final". The Guardian. Retrieved 31 August 2015. ^ "Real Madrid sign Javier Hernández on loan from Manchester United". The Guardian. 1 September 2014. Retrieved 2 September 2014. ^ "Chicharito Hernández signs his contract with Real Madrid". Real Madrid C.F. Retrieved 1 September 2014. ^ "Real Madrid 1–2 Atl Madrid". BBC Sport. 13 September 2014. Retrieved 20 September 2014. ^ "Deportivo de La Coruña 2–8 Real Madrid". BBC. 19 September 2014. Retrieved 19 September 2014. ^ "Javier Hernandez scores as Real Madrid beat Atletico Madrid". ESPN FC. 22 April 2015. Retrieved 23 April 2015. ^ Begley, Emlyn (26 April 2015). "Celta de Vigo 2–4 Real Madrid". BBC Sport. Retrieved 26 April 2015. ^ "Javier Hernandez back at Man Utd as Real Madrid decide against deal". BBC Sport. 26 May 2015. Retrieved 26 May 2015. ^ Burt, Jason (29 August 2015). "Manchester United manager Louis van Gaal tells Javier Hernandez he is free to leave". The Daily Telegraph. Retrieved 18 September 2018. ^ Johnston, Neil (23 August 2015). "Man Utd 0–0 Newcastle". BBC Sport. Retrieved 23 August 2015. ^ "Revealed! The most lethal Premier League goal scorers of all-time". talkSport. 7 October 2014. Retrieved 23 October 2015. ^ "Chicarito completes transfer from United to Bayer Leverkusen". Manchester United F.C. Retrieved 31 August 2015. ^ "Javier Hernandez: Man Utd striker joins Bayer Leverkusen for £7.3m". BBC Sport. 31 August 2015. Retrieved 31 August 2015. ^ "Chicharito makes Bayer Leverkusen debut". Goal. Retrieved 12 September 2015. ^ "Bayer Leverkusen 4 BATE 1: Hernandez nets in comfortable win". FourFourTwo. Retrieved 16 September 2015. ^ "Hernandez strike downs Mainz". Bundesliga. Retrieved 23 September 2015. ^ Howarth, Matthew (20 October 2015). "Leverkusen leave it late in eight-goal thriller". UEFA. Retrieved 20 October 2015. ^ "Javier 'Chicharito' Hernandez". Goal.com. Retrieved 10 December 2015. ^ "Chicharito Named Bundesliga Player of the Month in November". teleSUR. 6 December 2015. ^ Dunbar, Ross. "Chicharito hat trick lifts Leverkusen to big win over Gladbach". Fox Sports. Retrieved 12 December 2015. ^ "Javier Hernandez hat trick carries Leverkusen, Bayern cruise to win". ESPN FC. Retrieved 12 December 2015. ^ "Javier Hernandez again named Bundesliga player of the month". ESPN FC. 30 December 2015. Retrieved 31 December 2015. ^ "Bayer Leverkusen 3–0 Hannover 96: Hernandez double downs Hannover". Vavel. 30 January 2016. ^ "JANUARY PLAYER OF THE MONTH: JAVIER 'CHICHARITO' HERNANDEZ". Bundesliga. 1 February 2016. Retrieved 6 February 2016. ^ "SC Hauenstein 1–2 Bayer Leverkusen". ESPN FC. ESPN. 21 August 2016. Retrieved 23 August 2016. ^ "Javier Hernandez to miss Bayer Leverkusen's Bundesliga opener after falling down stairs". Sky Sports. 23 August 2016. Retrieved 23 August 2016. ^ Rosenblatt, Ryan. "Chicharito goes from Bayer Leverkusen hero to goat as Bayer Leverkusen lose". FOX Sports. Retrieved 17 September 2016. ^ McCauley, Kevin. "'Chicharito' Javier Hernandez completes hat trick with stoppage time winner for Bayer Leverkusen". SB Nation. Retrieved 24 September 2016. ^ "Chicharito voted September Player of the Month!". Bundesliga. Retrieved 30 September 2016. ^ Sayer, Brandon. "Bayer 04 Leverkusen 2–3 Borussia Monchengladbach: Foals produce stunning second half comeback to give Hecking perfect start". Vavel. Retrieved 28 January 2016. ^ "Chicharito, el mexicano con más partidos en Champions League". Goal.com (in Spanish). Retrieved 21 February 2017. ^ "Javier Hernandez: West Ham sign striker from Bayer Leverkusen for £16m". BBC Sport. 24 July 2017. Retrieved 24 July 2017. ^ "Javier Hernandez completes transfer to West Ham United". West Ham United F.C. Retrieved 24 July 2017. ^ Jurejko, Jonathan. "Manchester United 4–0 West Ham". BBC Sport. Retrieved 13 August 2017. ^ Chapman, Caroline. "Southampton 3–2 West Ham". BBC Sport. Retrieved 19 August 2017. ^ "Report: Chicharito Could Miss Two West Ham Games With Hamstring Injury". Sports Illustrated. Retrieved 15 November 2017. ^ Burnton, Simon (11 November 2017). "David Moyes assures Javier Hernández he has a future at West Ham". The Guardian. Retrieved 11 November 2017. ^ "Transfer report: West Ham striker Javier Hernandez in talks with Turkish champions Besiktas". talkSport. Retrieved 17 January 2018. ^ "West Ham 1–1 Bournemouth: Hernandez scores first time since October to cancel out Fraser strike". Daily Mirror. Retrieved 20 January 2018. ^ "'We needed him today' – Moyes tackles Chicharito transfer talk after goal against Bourenmouth". Goal.com. Retrieved 20 January 2018. ^ "Javier Hernandez can't explain fine goal scoring record against Chelsea". ESPN. 8 April 2018. Retrieved 18 October 2018. ^ "AFC Wimbledon 1–3 West Ham: Hammers turn it on in second half against 10-man Dons". Sky Sports. 28 August 2018. Retrieved 18 October 2018. ^ "Pellegrini: "Chicharito está enfermo"" (in Spanish). West Ham United F.C. 14 September 2018. Retrieved 19 October 2018. ^ Marshall, Tom (4 October 2018). "Javier 'Chicharito' Hernandez back training with West Ham after fever". ESPN. Retrieved 19 October 2018. ^ Bullin, Matt (3 November 2018). "West Ham 4–2 Burnley". BBC Sport. Retrieved 4 November 2018. ^ Hafez, Shamoon (22 February 2019). "West Ham 3–1 Fulham". BBC Sport. Retrieved 22 February 2019. ^ "Chicharito reaches 50th career Premier League goals with strike against Fulham". Goal.com. Retrieved 22 February 2019. ^ "Javier Hernández the hero as West Ham beat Huddersfield in seven-goal thriller". The Guardian. Retrieved 16 March 2019. ^ FIFA.com. "FIFA U-20 World Cup archive – FIFA". ^ "Mexico 1–2 Colombia". Medio Tiempo. Archived from the original on 10 February 2012. Retrieved 30 September 2009. ^ "Soccer: Gutsy All Whites fall to fiery Mexico". The New Zealand Herald. APN Holdings NZ. 4 March 2010. Archived from the original on 25 May 2012. Retrieved 6 March 2010. ^ "Mexico 2–1 North Korea: Hernandez Strikes Again". Goal.com. Retrieved 18 March 2010. ^ "Netherlands 2–1 Mexico". ESPN Soccernet. 26 May 2010. Retrieved 30 March 2011. ^ "Mexico 5–1 Gambia". ESPN Soccernet. 30 May 2010. Retrieved 30 March 2011. ^ Stevenson, Jonathan (11 June 2010). "South Africa 1–1 Mexico". BBC Sport. Retrieved 11 June 2010. ^ "Mexico subs shoot down France". FIFA. 17 June 2010. Archived from the original on 2 September 2011. Retrieved 3 July 2010. ^ Dawkes, Phil (17 June 2010). "France 0–2 Mexico". BBC Sport. Retrieved 17 June 2010. ^ Bartram, Steve (17 June 2010). "Chicharito steals the show". Manchester United F.C. Retrieved 3 July 2010. ^ "France-Mexico". FIFA. 17 June 2010. Retrieved 3 July 2010. ^ "Tevez shines as Argentina oust Mexico". FIFA. 27 June 2010. Archived from the original on 11 December 2010. Retrieved 3 July 2010. ^ Fletcher, Paul (27 June 2010). "Argentina 3–1 Mexico". BBC Sport. Retrieved 27 June 2010. ^ "Statistical stars from the group stage". FIFA. 26 June 2010. Archived from the original on 2 April 2011. Retrieved 6 March 2011. ^ "Silva salvages draw for Spain". ESPN Soccernet. 11 August 2010. Retrieved 12 August 2010. ^ Guzmán, Sergio (9 February 2011). "México 2–0 Bosnia-Herzegovina... Debut esperanzador". Medio Tiempo (in Spanish). Archived from the original on 14 July 2011. Retrieved 9 February 2011. ^ "Hernandez stars for Mexico". FIFA. 27 March 2011. Retrieved 27 March 2011. ^ "Hernandez stars for Mexico". The Guardian. UK. 6 June 2011. Retrieved 6 June 2011. ^ "Hernandez strikes Gold". Manchester United F.C. 10 June 2011. Retrieved 10 June 2011. ^ "Hernandez fires Mexico through". Manchester United F.C. 19 June 2011. Retrieved 19 June 2011. ^ "Chicharito lifts Gold Cup". Manchester United F.C. 26 June 2011. Retrieved 26 June 2011. ^ "Japan 1–2 Mexico". BBC. 22 June 2013. ^ "Mexico beat Croatia to spark Recife fiesta". FIFA. Retrieved 23 June 2014. ^ "Javier Hernandez injury a cruel setback to the striker and Mexico". ESPN FC. 2 July 2015. ^ Baxter, Kevin. "Mexico scores twice late to turn back Uruguay, 3–1, in Copa America group game". Los Angeles Times. Retrieved 5 June 2016. ^ "Mexico through to Copa América quarters after seeing off Jamaica". The Guardian. Retrieved 9 June 2016. ^ Gonzalez, Roger. "Chicharito becomes all time leading goalscorer for mexico". CBS Sports. Retrieved 31 May 2017. ^ "Portugal 2–2 Mexico". BBC Sport. Retrieved 18 June 2017. ^ "World Cup 2018: Javier Hernandez breaks down in tears at full-time of win for Mexico against Germany". The Sun. Retrieved 19 June 2018. ^ "Mexico in dominant win over South Korea". BBC. 23 June 2018. ^ Bagchi, Rob. "Mexico edge towards knockout round at World Cup after Carlos Vela and Javier Hernandez all but end South Korea hopes". The Daily Telegraph. Retrieved 23 June 2018. ^ "ESPN Stats & Info on Twitter". Retrieved 23 June 2018. ^ "Javier HERNANDEZ". FIFA. Retrieved 22 October 2018. ^ "Javier Hernández and the best tap-in merchants". The Daily Telegraph. ^ a b "The False 9: Javier Hernandez – Rebirth of the Poacher?". The False 9. Retrieved 4 June 2011. ^ Taylor, Daniel (16 March 2011). "Sir Alex Ferguson hails form of Javier Hernández for Manchester United". The Guardian. Retrieved 30 January 2016. ^ a b Christenson, Marcus. "Javier Hernández and the underrated art of the clinical goalscorer". The Guardian. Retrieved 2 November 2016. ^ Richard Jolly (31 August 2015). "Javier Hernandez signs for Bayer Leverkusen from Manchester United". ESPN FC. Retrieved 29 January 2016. ^ "Inside the churning mind of Mexico's Javier 'Chicharito' Hernandez". Sports Illustrated. Retrieved 31 May 2016. ^ Wahl, Grant (3 May 2018). "Masters of Modern Soccer: Chicharito and the Art of Mexico's Synchronization". Sports Illustrated. Retrieved 18 October 2018. ^ Tuck, James; Berkeley, Geoff (8 April 2010). "Get to know... Hernandez". Manchester United F.C. Retrieved 15 June 2010. ^ "Hernandez's father quits to see him play". ESPN Soccernet. 4 June 2010. Archived from the original on 7 June 2010. Retrieved 30 June 2010. ^ Witz, Billy (1 April 2010). "For World Cup, Javier Hernández Could Be Mexico's Next Big Thing". The New York Times. ^ a b "Chicharito es embajador de UNICEF". El Economista (in Spanish). 26 May 2012. Retrieved 27 May 2012. ^ Lecanda, León (26 May 2012). "Chicharito es embajador de Unicef" (in Spanish). ESPN. Retrieved 27 May 2012. ^ "Chicharito to ditch his pre-match Catholic prayer at Ibrox". theredevilspot.blogspot. 24 November 2010. Retrieved 13 June 2014. ^ Thomas Peters. "Professional Soccer Player Facing Persicution For Pre-Game Catholic Prayer". CV (Catholic Voice). Archived from the original on 11 November 2014. Retrieved 13 June 2014. ^ Kevin McCauley (26 May 2011). "UEFA Champions League Final 2011: Manchester United's Chicharito Is The Story in North America – FMF State of Mind". SB Nation. Retrieved 14 June 2014. ^ "FIFA 14 – North America Cover Reveal". EA Sports. 27 June 2013. Retrieved 28 June 2013. ^ "Javier 'Chicharito' Hernández anuncia que será padre". Milenio (in Spanish). 14 January 2019. Retrieved 14 January 2019. ^ "Ten things about Mexico's most famous export Javier 'Chicharito' Hernandez". Bundesliga. Retrieved 25 July 2017. ^ "Javier Hernández". Medio Tiempo. Retrieved 25 April 2017. ^ "Javier Hernández". Worldfootball. 1 June 2010. Retrieved 1 June 2010. ^ "Javier Hernández". Football Database. 1 June 2010. Retrieved 1 June 2010. ^ Endlar, Andrew. "Javier Hernandez". StretfordEnd.co.uk. Retrieved 23 February 2010. ^ "Javier Hernández". ESPN FC. Retrieved 8 February 2017. ^ "Javier Hernández". National Football Teams. Benjamin Strack-Zimmerman. Retrieved 2 September 2011. ^ a b c d ""Chicharito" Hernández – Awards and honours". Soccerway. Retrieved 13 January 2014. ^ "Chicharito: Overview". Premier League. Retrieved 17 April 2018. ^ "Watch: Chicharito goal gives Mexico 1–0 lead over U.S." Sports Illustrated. Retrieved 10 June 2016. ^ "'Chicharito' se lleva dos premios Balón de Oro". El Informador. Guadalajara. Retrieved 30 June 2017. ^ "Bundesliga Idol: Javier 'El Chicharito' Hérnandez". Bundesliga. Retrieved 8 December 2015. ^ "Team of the Season 1516 Results". Bundesliga. Archived from the original on 15 July 2016. Retrieved 16 May 2016. ^ "Leverkusen's Chicharito voted February Player of the Month!". Bundesliga. Retrieved 30 June 2017. ^ "Javier Hernandez and Carli Lloyd Named 2015 CONCACAF Players of the Year". CONCACAF. Retrieved 22 January 2016. ^ a b "PICTURES: Chicharito Wins Gold Cup". Republik of Mancunia. Retrieved 30 June 2017. ^ "Chicharito Hernández, el más popular de Concacaf según la IFFHS". Record. Lisbon. Retrieved 30 June 2017. Wikimedia Commons has media related to Javier Hernández Balcázar.